Welcome to Krapil’s! We invite you to join us in our rustic dining room or expansive outdoor patio for a hand-cut steak and made-from-scratch appetizers. "With dishes like these, there's a reason we call them specials!" "Evenings are just better when they're spent on our patio." "Come see Abby Anderson play this Thursday, April 25 at 7:30 PM! We'll see you then. Contest ends April 22nd, enter at: https://big955chicago.iheart.com/contests/win-meet-greets-abby-anderson-601772/"
"Does it get any better than this? We don't think so." "Join us every week for a night of great food, drinks, and live music! View our calendar here: http://www.krapilssteakhouse.com/calendar/"
Best shrimp. Ever. Get them. Do it. Yes, I'd like to receive news from Krapil's Steakhouse & Patio. 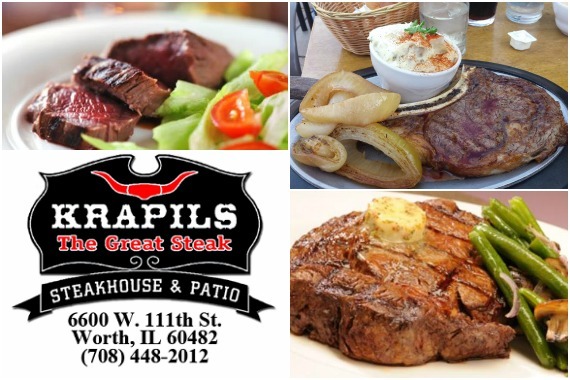 Sign up for the Krapil's Steakhouse & Patio Newsletter!